We trust that your Christmas Holidays were kind to you. Perhaps you even scored a few packs of Innistrad in your stockings hung by the chimney with care. 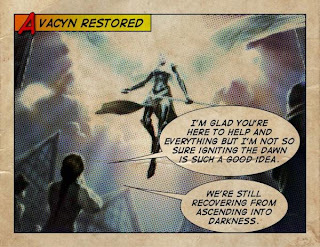 Anywhoos - not much happening on the Dark Ascension spoiler front (we'll get to the little bit soon), but there is some movement regarding Magic the Gathering premier play. We suggest that if you plan to reach beyond the kitchen table for the stars you should read the updates on the mothership. Check out this article entitled 'Revamped Premier Play Coming in 2012' regarding Planeswalker Points, Pro Tour, Grand Prix, and World Championships, as well as this article, 'Addressing Changes to 2012 Magic Premier Play', regarding further explanations and details the information in the previously linked article. Righto - back to the little piece of Dark Ascension spoiler. 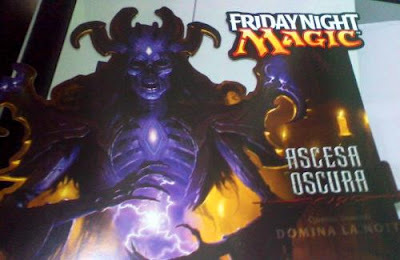 This Dark Ascension artwork, featured on what appears to be a Friday Night Magic poster promotes the upcoming set release and is thought to be sent out to participating stores in January. This information is from the same Italian source (OniReject from the forums) who had shared an image of a Dark Ascension Intro Pack. 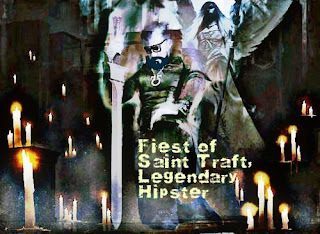 Again, we advise you to consider this rumour until officially released by Wizards of the Coast . . . The poster, in Italian reads, 'Dark Ascension, This Friday, Command the Night. This is really cool art. 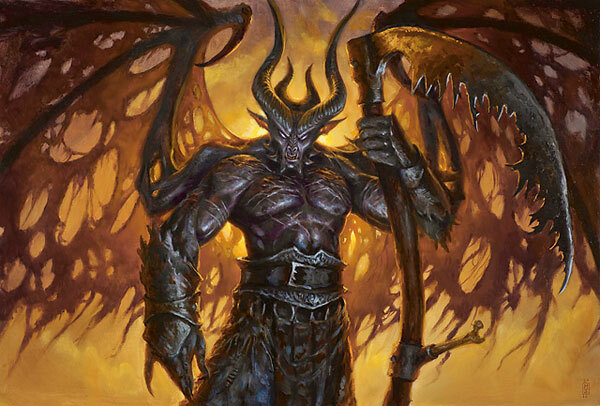 Is it a Demon, a Lich, Grislebrand himself, or just a random art meant to show some necro spell ? Some one on the forums mentioned a passing resemblance to a Draugr Deathlord, of Skyrim fame - we kind of agree. That's it for now, we might get another post off before New Year's but if not, play safe and don't drink too much goblin punch. We thought it best to do a catch-up today on MTG Realm with a variety of Magic the Gathering news which for whatever reason we felt not to dedicate a full post for. Strap yerself in for the ride . . .
On Twitter, WoTC minion MaRo dropped some interesting news about the second and third sets in the Innistrad block. Specifically, he mentioned that Dark Ascension will as with the previous set, as many have already postulated, have double-faced cards (or DFC's) - BUT - according to his tweets, Avacyn Restored will NOT have any double-faced cards. We are rather interested in the story line / flavour as to why and will wait with anticipation until February / May until all the blanks are filled in. Here are MaRo's tweets . . .
@maro254: I've gotten a lot of people inquiring, so let me set the record straight. #MTGDKA will have cool new DFCs. #MTGAVR will not have any. This interesting image showed up on the forums whose posted indicated that this is a Red / White Dark Ascension Intro Pack. Specifically, Ascesa Oscura is the Italian name for this set and the foil rare appears to be an Angel with red hair. Unfortunately, as the image is small, we can only guess as to the other qualities (including mana-cost) of said card. Time as well as to catch up with upcomming Promo Cards. The following Gateway / Wizards Play Network promo cards should be showing up in a game store near you. 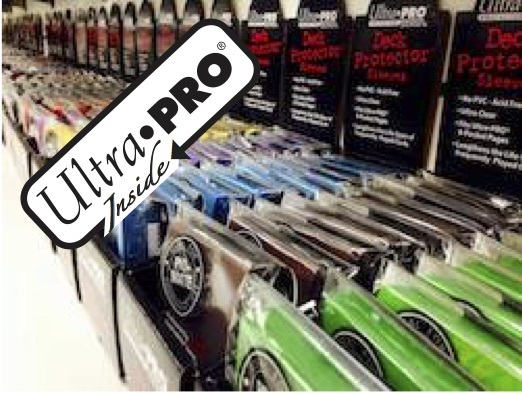 If you are not in the know, Gateway promos are foil promotional cards provided to players for participating in tournaments at local stores. Next up - MOAR MTG comics from IDW. IDW Comics have now released some details and the cover for MTG Comic #4. Our local store Big B Comics should be expecting the first issue in the series shortly. Anywhoos - here's the 4.1.1 on the latest issue . . .
*Variant covers: Variant Tyler Walpole cover! Bullet points: This issue includes an exclusive, alternate art playable Magic: The Gathering card! Continuing the adventures of the brand new Planeswalker, Dack Fayden! The folks over at MTG Mint Card has one heck of a Christmas Holiday deal - you can knock off 50% (!) off express shipping for any purchase. This deal is good until 21st December which should allow you loads of time to Christmas shop for that special MTG fan. The Magic the Gathering community at large have been for the last few weeks been contemplating and speculating on today's Banned and Restricted (B&R) cards update. While some players incorrectly guessed that Hovermyr was to get the ban-hammer, most did guess correctly and fingered Wild Nacatl to crumple under the new update. These regular updates to rules, as well as the banned and restricted list by Wizards of the Coast are effected to ensure the continued variety and health of each of the following formats : Standard, Modern, Extended, Block, and Two-Headed Giant. For the full Magic the Gathering rules (issued today 12/20/2011) effective 1/01/2012, wing on over HERE. For the full document click on over HERE. 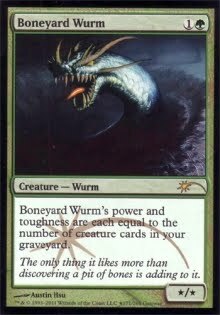 The 'Modern' format is a non-rotating format consisting of sets from essentially any and all cards from 8th edition forward (black-bordered cards) which is gaining popularity with players. One popular deck archetype in this format is the creature-based aggro 'Zoo' build of which Wild Nacatl was a 'go-to' card. This one-drop giving you a 1/1 creature can rapidly advance to a 3/3 body should you contro a Plains and a Mountain. Although not format-warping, Wizards did feel that the format would be healthier without it. The other card to get banned from Modern is Punishing Fire. Punishing Fire, when combined with Grove of the Burnwillows, gives a repeatable 2 damage for 3 mana which can be devastating to weenie decks. This combination provides a one life gain to your opponent but can wreck your opponent's ability to field any offense against you. General: Language fixes, particularly streamlining the opening sentence of each section. Terminology fixes. 1.4: New section on Optional Abilities. 3.1: Important changes - Opponents are no longer responsible for triggers. Some triggers are optional and handled differently. Missed triggers being put on the stack now go on the bottom. Actions are completed before doing so. Players other than the controller of a trigger are under no obligation to point out that a trigger has been missed, though they may do so if they wish. 3.5: Clarification for when Improper Drawing at Start of Game applies. 3.7: Failure to Maintain Game State does not apply when the opponent misses a trigger. The Judge must believe intention here. 4.3: Attempting to perform a loop with an indeterminate end point is now Slow Play such as derping around (reviewing / taking notes) without any significant change in game state. 4.7: Added a reminder of the Player Communication Rules to the philosophy. That's it for now, until tomorrow's post MTG Realm reminds you to play it safe - always use card sleeves. We continue today with our 'General Election' series of posts. Previous posts are HERE ( / ) and HERE ( / ) where we ask you, the MTG Realm reader to assist us in choosing our next EDH / Commander General. In this, our third of four posts, we delve into Simic ( / ) to find a General for our new EDH / Commander deck. The blue and green coupling in Magic the Gathering is thematically about going big and being sneaky - kind of like that 2-pound Fruitcake which somehow makes it's way back into our kitchen no matter how many times we've chucked it over the neighbours fence. In Ravinca's Dissension set, the Simic Combine was all about biomancy while in latter sets, this colour combination provided loads of triggers and card draws. First up - Edric, Spymaster of Trest. Hailing from the port city of Trest, this rogue Elf is at the center of all intrigue, sophistry and strategy. For a mana cost of one colourless, one blue and one green, you get a 2/2 creature with a solid card-draw ability when a creature deals combat damage to one of your opponents. Excellent in a 1v1 game, multiplayer / Commander. This card's flavour may translate well in mulitplayer as it provides an environment for political alliances. Next up is Momir Vig, Simic Visionary. This Elf Wizard comes with a 2/2 body for five mana but don't let that cost put you off - check out his abilities. 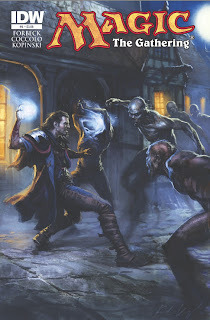 While on the game table, you can float a creature to the top of your library when you resolve a green spell and you are able to put that creature from the libary top into your hand when you cast a blue spell. This legendary creature has tool-box written all over it - and when you are playing Commander, being able to respond to an opponent's threats or weaknesses gives you an amazing advantage. Something rather interesting had popped up on the Magic the Gathering spoiler radar recently. An Italian gamer had posted to YouTube what appeared to be an trailer for the upcoming Duels of the Planeswalker 2013. If you recall from last year, the DotP release coincides approximately with the core set release and contains many similar cards. With the release of core set M13 and DotP 2013, we expect much of the same. The video for the Magic 2013 trailer appears to be real with the same motion comic style and narration, perhaps just not quite finalised. There are some fans which perhaps thought it fake but when Wizards of the Coast requested that content to be removed, the argument for a leaked trailer became convincing. Nicol Bolas appears to be narrating and speaking about the original 'Lorwyn Five' planeswalkers rather than the updates we received in the last core set. Anywhoos - no video but here are some stills . . .
Of my foes, these five are potentially are potentially problematic. A noble predator, he believes himself to be. This Garruk Wildpeaker brutal savage, nearly merciless killer. His impatience is my virtue. 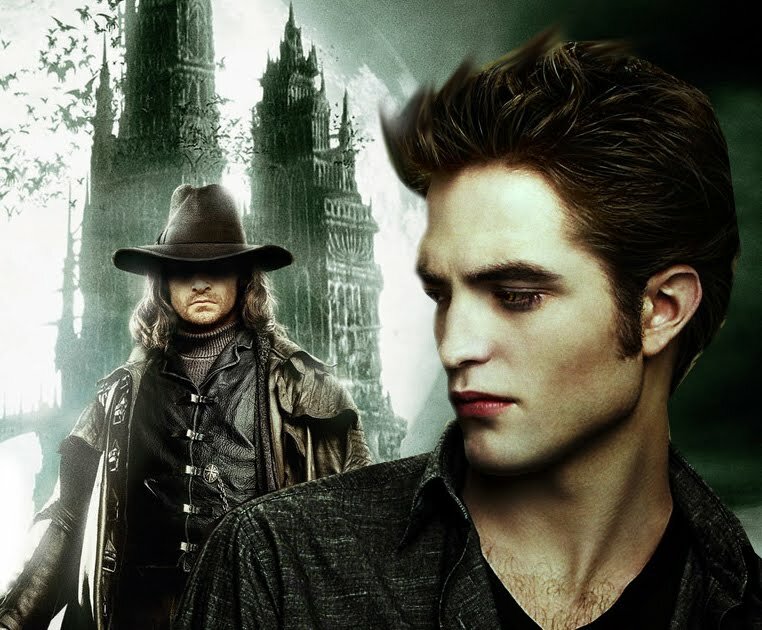 Jace Belaren's greatest strength is his greatest flaw. A supremely powerful mind incapable of perceiving how he could rule all. The keystone in an unfathomable plan. So utterly filled with power, so wholly lacking in restraint and vision. Seeking freedom. Will Chandra Nalar rise above personal retribution or will her furry consume all? A dark power commanding the dead, Lillianna Vess inspires terror. In debt to demons, entranced in a pursuit of unattainable desire as ruthless as myself. Reinforcer of life, light and strength in allies, a contemptible blight. Should we cross again, I'll snuff Agani Goldmane's spark, consigning him to an endless night. They're but obstacles, part of a grand design. Fight them endlessly, they're likely to prevail every time. However, should you prove to be a duelist of measure, having depeated these opponents with skill, consider your fate. Or, if you dare face me, destroying you shall be my pleasure. We now have, via WoTC Monty on the mothership, the formal announcment today of the third and final Magic the Gathering set in the Innistrad block. Let's get to just a bit of background first. Magic's May 2012 set, code-named "Roll," is called Avacyn Restored. Although it's the third set of the Innistrad block, it will be a large set. This means that Innistrad Block Constructed will be composed of all three sets, but Avacyn Restored will be drafted by itself. Sealed events will use six Avacyn Restored booster packs. The angel in the art is generally accepted to be that of Avacyn herself due mainly to the set name. She appears to be coming in for a landing in the Town of Gavony but what interests us is that of the reaction of the villagers - are they happy, surprised or terrified ? 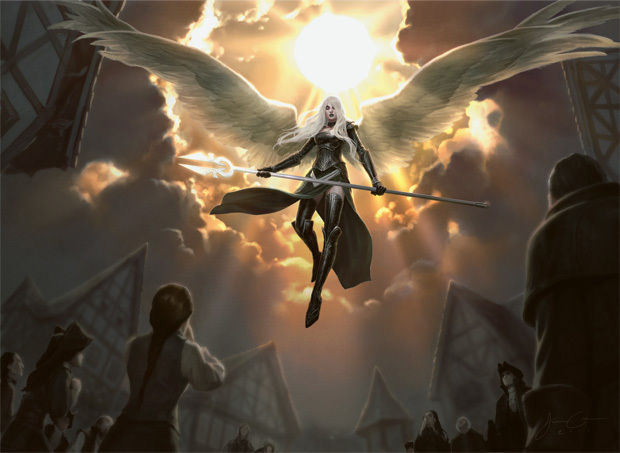 Avacyn's appearence is not like the typical cheerleader angel - she looks touched by evil and we bet will be not mono-white but multi-colour - perhaps black and white. Perhaps her time in banishment with the demon Griselbrand (in the Helvault? ), changed both of them - or merged them. Also of note - this will be a large set! Please drop your comments below - your speculations / hopes for the next two sets. Today we wanted to yatter a bit about that new Innistrad uncommon Fiend Hunter. Why? We've noticed that this card has gained some popularity and players, whether aggro or control, are giving it serious consideration for inclusion in their Magic the Gathering builds. This 1/3 for a cmc of three (one colourless and two white mana) provides an excellent 'enters the battlefield' trigger which could be messed up by Torpor Orb but fortunately that card does not see popular play. What's the effect ? The player gets to exile another creature as long as the Fiend Hunter remains in play. This is a bit reminescent of Leonin Relic-Warder which eilies artifacts / enchantments and Oblivion Ring which exiles any non-land permanent. 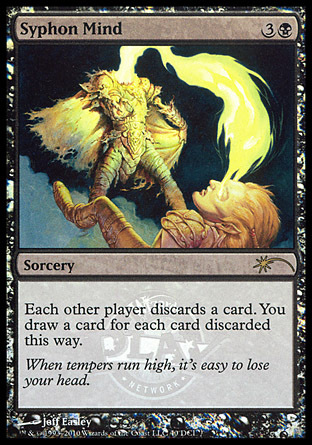 We love this type of card and can only hope that the next set, Dark Ascension, has a functional reprint of Tidehollow Sculler from Shards of Alara which gave you the opportunity for early control by exiling a non-land card directly from your opponent's hand. The downside of course is when your Fiend Hunter gets pwn'd, you have to give up the loot. Turning that frown upside down though may be possible with some handy recursion Disentomb tech via Sun Titan - hoorah for 3 cmc spells!. Hopefully by this time, you would already have sufficient resources on the game table or in your hand to not care about the threat you had just buried with Fiend Hunter. So where to put this guy ? That is completely up to you. The crew here at MTG Realm loves rogue and casual builds but found that Fiend Hunter is best on a mono-white or blue-white human build. A Geist aggro build also could use this guy. One build we are considering to take for a spin at Friday Night Magic includes Doomed Traveler, Fiend Hunter, Geist of Saint Traft, Hero of Bladehold, Leonin Arbiter, Leonin Relic-Warder, and Mirran Crusader. 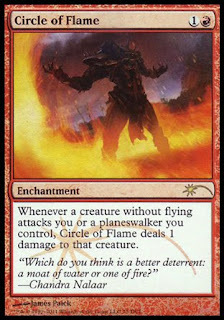 Supporting cards such as Angelic Destiny, Dismember, Honor of the Pure, Mana Leak, Oblivion Ring & Sword of War and Peace round out the rest of the choices. For a more 'human-centric' build a must-have for us is the versatile Bonds of Faith and some of those human-friendly equipments in Innistrad such as Silver-Inlaid Dagger. We want to know where you use Fiend Hunter - drop a comment in the comment thingy below.